In the article ”First Nations hepatitis C virus infections. Six-year retrospective study of on-reserve rates of newly reported infections in northwestern Ontario,”1 which appeared in the November issue of Canadian Family Physician, an error was inadvertently included. The corrections appear below. The 2011 rate per 100 000 (95% CI) of newly reported cases of hepatitis C virus infection should have been 135.5 (112.7 to 158.3) in Table 1. This change affects the initial slope of the rates presented in Figure 1 but does not affect the overall increasing trend. The upper limit of the 95% CI for the 2014 rate should be 327.3. The correct versions of Table 1 and Figure 1 are presented here. The authors apologize for the error and any confusion it might have caused. Newly reported HCV antibody-positive test results and rates per 100 000 in SLFNHA communities by year: The total no. of reported cases was 267. 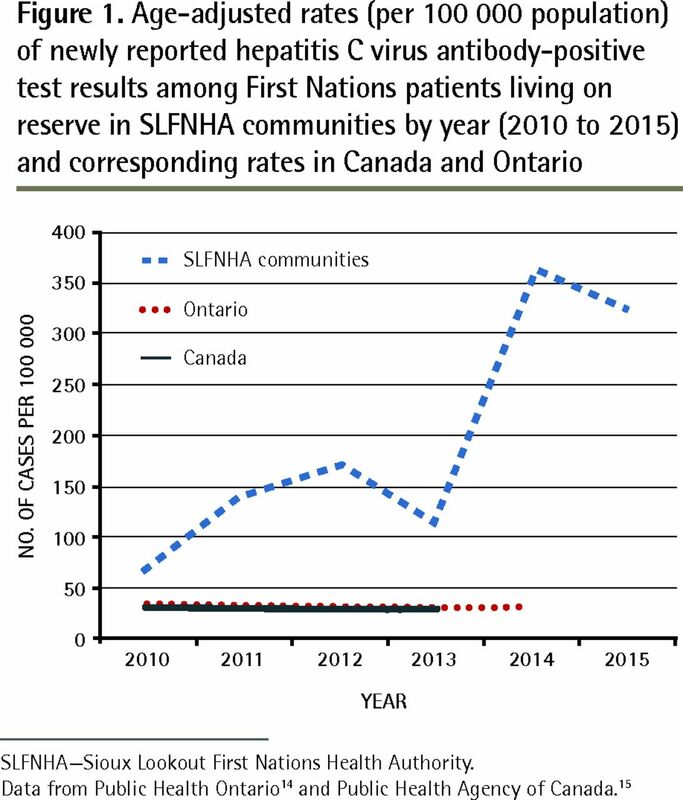 SLFNHA—Sioux Lookout First Nations Health Authority.
. First Nations hepatitis C virus infections. Six-year retrospective study of on-reserve rates of newly reported infections in northwestern Ontario. Can Fam Physician 2017;63:e488-94. Available from: www.cfp.ca/content/cfp/63/11/e488.full.pdf. Accessed 2017 Dec 5.